Brent Green is an American animator. Although he started out in cell animation, he really made his mark with innovative stop-motion animation to tell intensely personal stories. After making a handful of short films, he produced, wrote and directed the feature-length Gravity Was Everywhere Back Then, which was made using stop-motion animation techniques, but with live actors. The film was named Bad Lit: The Journal of Underground Film's Movie of the Year for 2010. Green frequently screens his films with a live musical score and with live narration. Also, he has displayed the sets and props in his films as installation pieces in art galleries all over the country, as well as creating original installation artwork. You can learn more about this filmmaker at the official site of his production company Nervous Films. It’s the secret origin of Santa Claus! 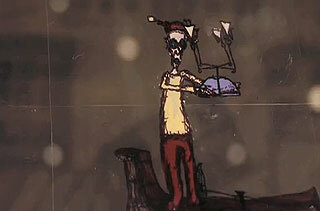 But, don’t let the kids watch as he’s a slightly nutty drunk in Brent Green’s animated Hadacol Christmas. Brent Green’s live-action, stop-motion Gravity Was Everywhere Back Then is a staggering achievement, a powerful rumination on love and art. June 15: Gravity Was Everywhere Back Then will be screened along with a live accompaniment by Brent Green, Brendan Canty, Donna K and more. Watch a trailer for Brent Green’s Gravity Was Everywhere Back Then, which includes the first ever live-action, stop-motion car crash. Watch the charmingly animated music video for Drew & The Medicinal Pen’s “Naming the Gap” directed by the super talented Donna K.